3.) Rose & Crown Pub – One of the lively and most popular bars in all of Walt Disney World can be found in the UK Pavilion in Epcot’s World Showcase. The Rose & Crown Pub is a charming location that brings the coziness and warm environment of a traditional British pub to life through dark wood accents, small details, and beamed ceilings. 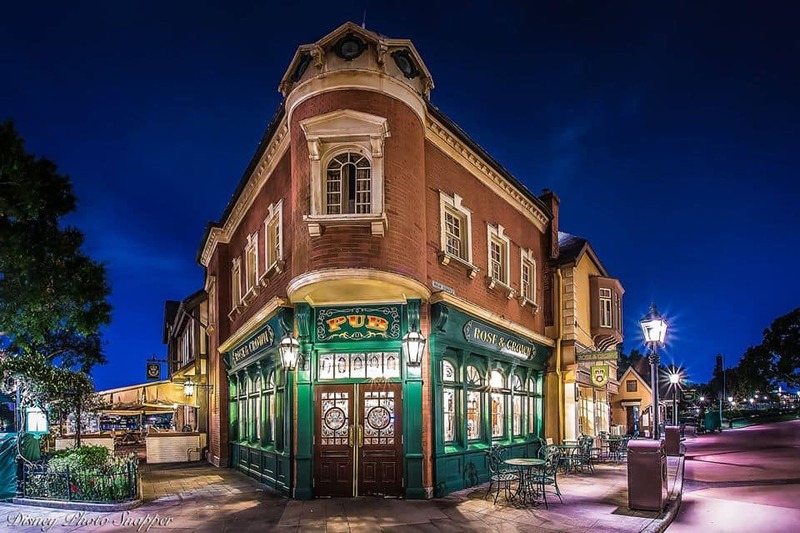 This popular hangout is often very busy on afternoons and evenings in Epcot thanks to the energy of the crowd, friendly barkeeps, and live piano entertainment. The Rose & Crown Pub serves up wine and cocktails, but is most popular for its plethora of beers on tap. Guests can sip on Boddingtons English Pub Ale, Strongbow Cider, Smithwick’s, Guinness Stout, Bass Ale, and more. Guests also love the unique pub blends which combine popular tap options such as the Half & Half Imperial Pint, Shandy Imperial Pint, Bumblebee Imperial Pint, and Golden Imperial Pint. Those lucky enough to snag a pot at the bar or table nearby can also enjoy some traditional pub fare including the Fish & Chips, Scotch Egg, Battered Banger and Chips, British Butty, and House-Made Seasoned Crisps.